Top Rank Promotions continued their relationship with ESPN tonight by placing one of boxing’s pound for pound superstars, Vasyl Lomachenko, on the main event in a WBO Junior Lightweight Title Bout. The Microsoft theater in Los Angeles, California was the host site for tonight’s card with an announced attendance of 4,102. The NFL Pro Football Hall of Fame ended late and the first undercard fight was shown on ESPN2. Arnold Barboza Jr. (16-0) and Jonathan Chicas (15-2) started off the telecast halfway through the bout and both boxers scored a knockdown by the sixth round. The crowd responded well to this bout as Chicas was going for an upset and had Barboza hurt several times throughout the bout. The next bout of the night was between Raymundo Beltran (33-7-1) and Bryan Vasquez (36-2) in the lightweight division. Vasquez came in overweight and was unable to fight for Beltran’s titles. However, Beltran looked significantly bigger than Vasquez inside the ring. Both boxers started off in the orthodox stance in the first round and Beltran was showing good head movement while landing his straight right hands and counter lefts. Vasquez switched stances during the first round, but was not effective with it. Beltran went to the body more I the second round and landed several hard shots in the last thirty seconds. Vasquez tripped Beltran at the end of the round. Vasquez started off the third round strong but Beltran took over in the second half of the round. Beltran’s best combination of this round started off with two hooks to the body followed by a left hook to the head. Vasquez was able to land an impressive wind up right uppercut on Beltran in the fourth round, but Beltran walked right through it and seemed unaffected. Beltran had Vasquez backing up with jabs to the body and head in the fifth round but may have been out landed by Vasquez during their exchanges. Vasquez appeared to be more willing to exchange in the sixth round, but Beltran’s punches were noticeably more effective and had more pop behind them. Beltran landed an impressive right hook around the high guard of Vasquez in the seventh and looked to be establishing firm control of the fight. Vasquez had a decent eighth round and proved to be elusive for Beltran and at the start of the ninth round Beltran had a cut by his right eye. Vasquez and Beltran clashed heads in the tenth and Vasquez probably needed a knockout to win. The blood was obscuring the vision of Beltran but he was able to avoid succumbing to a last round knockdown. Beltran was bloodied but walked away with a close win. The final scores were 95-95, 96-94, and 96-94. The main event of the evening was between WBO Junior Lightweight Champion Vasyl Lomachenko (8-1) and Miguel Marriaga (25-2). Both boxers showed a lot of upper body movement in the opening round but Lomachenko was the boxer that was applying the pressure. Marriaga was able to land the early punches but Lomachenko began to land some good combinations as the round came to an end. The pressure by Lomachenko continued in the second round and he was able to land hard left uppercuts and punches from all angles. Marriaga was tagged with hard lefts to the head and body in the third round as Lomachenko was starting to settle into his grove. 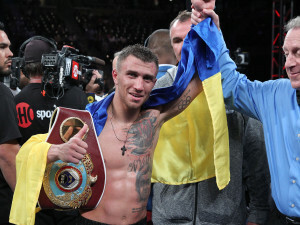 Lomachenko landed two consecutive straight left hands on Marriaga that sent him to the mat. Marriaga was able to get back to his feet and Lomachenko willingly backed into a corner and waived Marriaga forward. Marriaga came forward and threw several punches at Lomachenko, but was not able to land anything of significance. 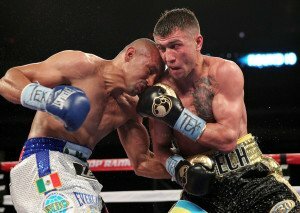 Lomachenko’s pressure continued into the fifth round but he suffered a cut near his left eye due to a clash of heads. Lomachenko’s pressure and hand speed had Marriaga back pedaling while getting peppered from all angles in the sixth and seventh rounds. Marriaga looked like he was hurt in the sixth round from a consistent body attack by Lomachenko. Lomachenko looked like he was going for the stoppage in the seventh round as he was landing heavy shots and taking a lot of risks. Lomachenko was able to score a late round knockdown and Marriaga looked mentally defeated as he went back to his corner. Marriaga’s corner told the referee their fighter was unable to continue before the start of the eighth round. Vasyl Lomachenko dazzles once again with a 7th round TKO. It’s now official – ESPNs interest in Manny Pacquiao is far from a one-off. Today it’s been announced that the network will also showcase two of the biggest names in the sport this August. 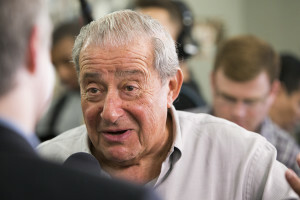 For Bud Crawford and Vasyl Lomachenko will be appearing on basic cable this summer, courtesy of ESPN and promoter Bob Arum. To make things perhaps more interesting, both men will be engaged in fights that are competitive, at least on paper. Crawford will have a junior welterweight title unification with Julius Indongo in Nebraska on August 19th. Two weeks earlier, on the 5th, Lomachenko will be facing off against Miguel Marriaga, who has battled the likes of Oscar Valedez and Nicholas Walters, in a super featherweight title scrap in LA. After a long, dry spell with HBO, it’s clear Arum is moving on to what he hopes are greener pastures. Rival Al Haymon has tried his hand at basic cable broadcasts with uneven success. Arum, however, is bringing out his stable’s big guns right out the gate. Things are certainly getting interesting as boxing’s bombastic 2017 thunders along.